But if you’re honest, do you really know why certain foods are bad for you, or do you just avoid “bad foods” because you were told to do so all of your life? People can tell you that certain foods are high in cholesterol, for example, but we need to ask ourselves the “why.” Why is having high cholesterol bad for you? Why are some foods considered bad for you? The truth of the matter is, even some “good food” may be bad for your health. It’s best to understand the “why” in order to make educated food decisions. Before we get you to that point, we’re going to get to the bottom of some other food misunderstandings: some food and nutrition myths. Yes, eating fruits and vegetables is healthy—and the chances of you losing weight will increase because consuming them makes the body more alkaline (higher pH). But you’re still cutting out meat, which is high in iron—and iron keeps your energy level up, which is extremely beneficial when exercising. The bottom line is, no matter what you put into your body, there are many factors that control your pH levels. When your pH levels are not balanced, your body won’t properly digest vitamins and minerals. Some of you may not have heard about this myth (and it’s a good thing you haven’t, because that’s all that it is—a myth). The bottom line is that anytime food is heated up—whether it’s baked, grilled or microwaved—some nutrients will be lost. Those nutrients are typically vitamin C and phytonutrients. Not all nutrients are zapped when cooked in the microwave; in some cases, water-soluble nutrients are actually retained, instead of being destroyed, when they are steamed in the microwave. If you want to avoid losing nutrients, don’t cook your food at a very high temperature and use as little water as possible; but you don’t have to avoid the microwave. We have all heard the myth about “negative calorie foods”— basically foods that contain more water than calories, so they essentially burn more calories than they contribute. That would be nice wouldn’t it? Unfortunately, no food exists with that power. For example, if you are eating celery, and it contains seven calories, the body still needs to use some of those calories to digest the food. Let’s say it takes 20% to digest celery—that means that even when digested, your body is still consuming about five calories from the celery. The calcium and potassium levels found in sea salt will only give you about one to two percent of your daily dose—not much for a premium brand, is it? This is very popular with vegetarians, as it is a good source of protein. Soy is naturally high in phytoestrogen, a plant-based estrogen that mimics the hormone in the body. Consuming phytoestrogen, according to independent research, can be very harmful to the body. For example, infants given soy formula on a regular basis consume a hormone load that is equivalent to four birth control pills a day. Soy protein has also been linked to asthma, breast cancer, kidney disease, and more. Many people will be surprised by this. When you consume fruit juice, you take in all the nutrients a fruit has to offer in a very short time. Let’s say you drink a bottle of orange juice that contains four oranges. Think of how long it normally takes you to eat four oranges—your blood sugar level rises at a good, steady pace. 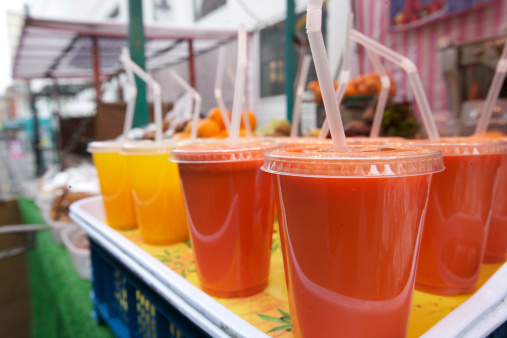 By drinking the juice instead, you are consuming those four oranges faster, forcing your blood sugar level to spike immediately, and then come crashing down even quicker. This also goes for your glucose levels: the crash is called hypoglycemia, and your body will need a quick boost, or fatigue will set in. Did you know that most of the fish that you buy at the grocery store have been contaminated with PCBs and pesticides? Salmon, tilapia, catfish, and cod are the most common types of farm-raised fish—so before you buy your next “fishy” meal, determine where it was sourced! Genetically modified popcorn may make a tasty treat, but it contains carcinogens. Even if you were to find an organic variety, it still may contain PFOA—a chemical linked to cancer. Next time, purchase your own organic kernels and pop your own popcorn without using the microwave! Genetically modified meat products are typically stuffed with pesticides and hormones—all of this enters your GI tract and literally gets stored in your fat cells. Margarine contains trans-fat, which has been known to clog arteries and cause cardiovascular diseases. It can also increase your chances of developing type 2 diabetes. Most vegetable oils are typically genetically modified and partially hydrogenated. This type of oil has also been linked to diseases, such as cancer, diabetes, heart disease, and digestive disorders. Table salt can cause hypertension. When manufacturers harvest table salt, they heat it at a high temperature—which strips out its rich minerals. It is used as a sugar alternative, but did you know that consuming artificial sweetener can actually lead to obesity or diabetes? According to research, sweeteners can cause a disturbance in the gut flora, including the intestinal bacteria that direct our metabolism. Most milk products, including conventional milk, are genetically modified—this is because cows are fed hormones in order to boost milk production. In addition, when raw milk is pasteurized, it loses most of its nutrients and its nutritional value becomes completely useless. Remember—don’t just take someone’s word on what type of food is healthy or unhealthy! Staying educated and informed about the food you consume, and where it is sourced, is the best way to maintain a healthy lifestyle. Axe, J., “10 Health Foods You Should Never Eat,” Dr. Axe web site; http://draxe.com/health-foods-you-should-never-eat/, last accessed April 28, 2015. “Health Foods To Avoid,” Thank Your Body web site; http://www.thankyourbody.com/health-foods-to-avoid/, last accessed April 28, 2015. Upton, J., “9 Internet Nutrition Myths That Just Won’t Go Away,” March 14, 2014, prevention web site; http://www.prevention.com/health/healthy-living/9-internet-nutrition-myths-just-wont-go-away.